Getting sweaty isn’t the most pleasant part of a workout for many people, but it remains a necessary evil for many of us. However, if fear of sweating is keeping you from reaching your fitness goals, there are plenty of steps you can take. Wear moisture-wicking clothing, tie your hair back with an elastic and a sweat band, and bring an ultra-absorbent towel with you to dry off during and after your workout. If you’re worried about hitting the office after a sweat session, you can also try workouts like swimming and weight lifting, which can get you fit, but won’t leave you as sweaty as more traditional cardio. 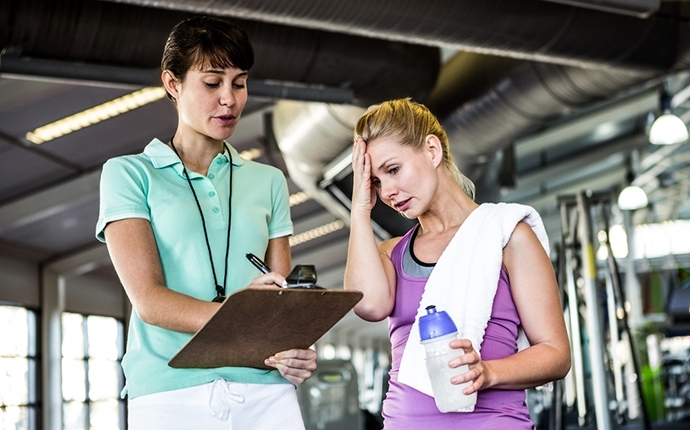 Fear of the scale is very real for countless individuals, and worries about getting weighed can make signing up for personal training more difficult than it should be. Fortunately, if stepping on a scale puts you outside your comfort zone, you absolutely don’t need to do it. While weight can be a good way to gauge your progress, tools like tape measures, calipers, and endurance tests can also show you just how far you’ve come. Eating the right foods for your workout can help keep you full, focused, and feeling great while you’re at the gym. However, with so many unhealthy, yet supposedly workout-friendly snacks on the market, it’s easy to find yourself confused about what you should be eating or not. Sticking to small meals that combine protein and complex carbohydrates and drinking plenty of water will keep you feeling good throughout your workout without triggering the crash that energy drinks or sugary protein bars can prompt.